Please accept my humble obeisances. All glories to Shrila Prabhupada and his disciples. I hope that this letter finds you in good health and in blissful Krishna consciousness This letter is in regarding my last letter dated 4 January concerning the topics surrounding the proper placement of bona fide gurus within our sampradaya. Dear prabhu, we are very much surprised at the lack of knowledge our devotees are displaying in the matter of understanding who is guru and who is not. Please be aware that a lack of understanding in this matter as displayed by most all the devotees, in all levels does not indicate a healthy situation for ISKCON. Could we reiterate what we have already stated in previous letters? What we are proposing is controversial but is backed up by statements by Prabhupada. Let's begin before the departure of Prabhupada. 1) Satsvarupa asks how initiations will go on after Prabhupada's departure (May 1977). Satsvarupa: Then our next question concerns initiations in the future particularly at that time when you are no longer with us. We want to know how first and second initiations would be conducted. Prabhupada: I shall recommend some of you, after this is settled up. I shall recommend some of you to act as officiating acharya. Satsvarupa: Is that called ritvik-acharya? 2) These new initiates would be Prabhupada disciples (June 1977). Tamal Krishna: These men. They can also do second initiation. So there's no need for devotees to write to you for first and second initiation. They can write to the man nearest them. But all these persons are still your disciples. Anybody who would give initiation is doing so on your behalf. Prabhupada: Yes.... So without waiting for me, whoever you consider deserves. That will depend on discretion. Tamal Krishna: Oh yes, discretion. 3) In Prabhupada's final instructions (BTG Vol. 13, 1-2), he states specifically that he did not appoint any leaders which means no one as successor guru(s). 4) Despite this clear instruction, Satsvarupa Maharaja in the editorial of the same Back to Godhead issue and in his Lilamrita Volume 6 declared that Prabhupada did select eleven men to succeed him as initiating guru, therefore today there is controversy and confusion. Now in your letter dated 19 November 1986, you did establish that Prabhupada did not appoint gurus but he appointed ritvik-acharyas which is established by the above mentioned line of reasoning. Then you indicated that if gurus were appointed, such appointment was done after Prabhupada's departure. Such appointments as done by GBC are not in line with Krishna consciousness as you have pointed out in your letter dated 27 December 1986. Prabhupada explains that (CC Mad 1.220 Purport), "Mundane votes have no jurisdiction to elect a Vaishnava acharya. A Vaishnava acharya is self-effulgent and there is no need for any court judgement." However in Satsvarupa's new book called, "Guru Reform Notebook" (p. 62), he declares that "The process for deciding who gives diksha must come from the GBC"
If you do discuss the matter at any length with any devotee as I have done with the publishing of my book, "The Science of Accepting a Spiritual Master--A Handbook for the Beginning Student of Spiritual Life," you'll find that as many devotees there are, there are that many different ideas, opinions, do-not-knows and confusions as to who is guru and how does one become guru. I again reiterate that this diversity of opinion is not good for the foundation of such a spiritual movement like ISKCON and is typical of pseudoreligious movements which have little or no spiritual potency. It appears that there exists to be a difference of opinion between yourself and Satsvarupa Maharaja as you take the shastrically correct position that the GBC has no jurisdiction to appoint gurus while Satsvarupa holds that GBC intervention is necessary. Simply the research has to be done as found in Prabhupada's books and summarized tightly in our literary attempt. Without authorization, eleven men had accepted the title of guru upon Prabhupada's departure This was a mistake as Prabhupada did not appoint anyone to act in this manner. In retrospect, this error should be admitted and the proper method of how to become guru very firmly established. Now is the proper time for such action. The question is, how did Prabhupada want his society to continue after his departure? Now we can answer your question of how can the departed guru accept disciples. This is most controversial point of our presentation not because it lacks sufficient evidence but because it requires some transcendental intelligence to comprehend. 1) Prabhupada did not appoint successor gurus. That means that the successor guru would have to come out by the will of Krishna. That method is the same method as was practiced by Prabhupada himself. The successor to Prabhupada would have to display the influence of a Vaishnava guru by the following version of Upadeshamrita (p. 58). "Shrila Bhaktivinoda Thakura has given some practical hints to the effect that an uttama-adhikari Vaishnava can be recognized by his ability to convert many fallen souls to Vaishnavism. One should not become a spiritual master unless he has attained the platform of uttama- adhikari. A neophyte Vaishnava or a Vaishnava situated on the intermediate platform can also accept disciples, but such disciples must be on the same platform, and it should be understood that they cannot advance very well toward the ultimate goal of life under his insufficient guidance. Therefore a disciple should be careful to accept an uttama-adhikari as a spiritual master." 2) Therefore not only the originally named eleven men who succeeded Prabhupada, but all of Prabhupada's disciples, could potentially be spiritual master However, none of them being fully conversant with the philosophy of Krishna consciousness were not qualified to immediately begin to accept disciples other than what is now commonly referred to as the "monitor" guru as explained in "Easy Journey to Other Planets". If anyone were qualified as uttama-adhikari, or fully conversant with the philosophy of Krishna consciousness, he would have detected the flaw in such a succession by the eleven successor acharyas. The fact that such lack of knowledge still remains today is evidenced by the necessity of a "Guru Reform Notebook" which, in and of itself, wrongly suggests that a guru is ignorant. However a true guru, uttama-adhikari is fixed and as stated above, "One should not become a spiritual master unless he has attained the platform of uttama-adhikari." 3) Initiations would go on by the ritvik process. Prabhupada's physical presence is not necessary. Towards the end, he was accepting disciples without his own approval and the new initiates were becoming Prabhupada's disciples simply on the recommendation of the ritvik- acharyas. That process was meant to continue until the successor acharya had appeared. Although it is not natural that the guru does not have a worthy disciple to succeed him, initiations should continue by ritviks until the successor comes out. 4) It is stressed over and over again that one must go to a guru. However, that guru does not necessarily have to be physically present. This is a material consideration. Usually, it is a physically present guru who can guide one personally. However, it is not all-important. It is suggested that one should not take shelter of less qualified gurus but only take shelter of the uttama-adhikari guru. Prabhupada states (CC Concluding Words Antya 5, p. 319), "Physical presence is sometimes appreciable and sometimes not, but vani continues to exist eternally. Therefore we must take advantage of the vani, not the physical presence." And what is diksha? It is not accurately described as a fire sacrifice performed by a physically present guru but it is when the disciple agrees to follow the instructions of the guru--personally present or not, the orders are equally beneficial when obeyed properly. Diksha is defined (Bhakti-sandarbha 868), "By diksha one gradually becomes disinterested in material enjoyment and gradually becomes interested in spiritual life." Why should that not come from an exalted guru like Prabhupada? Simply because he is not personally present does that mean that one cannot have access to his teachings in his books that has been described to be with us for the next ten thousand years? 5) The process shall go on exactly as it states in your letter, "Someone can become Prabhupada's shiksha-disciple when he first joins, reading Prabhupada's books. After he sufficiently understands the books, if he meets a devotee who inspires confidence in him and exemplifies the teachings of the book, he may accept such a devotee as his initiating spiritual master and also accept instruction from him." However, as stated above, this process should only go on if there is an uttama-adhikari devotee who can properly accept disciples. This process can go on without a uttama-adhikari devotee as done at present but should not be encouraged. Rather initiations should go on by the ritvik process until such uttama-adhikari becomes manifest. In summary, therefore, Prabhupada did not appoint gurus and since the GBC should not do so, all initiations done since Prabhupada's departure were done in a errant manner. Consider, for example, my scenario. I joined the movement as you were leaving Chicago in 1980 when the temple moved from Evanston. Instead of searching out a bona fide guru and being taught the science of how to know who is guru, we were automatically given a guru by zone. First it would have been Jayatirtha, then it was to be Acharyadeva, then finally it was Rameshvara; however, we had no idea what were the qualities and character of such a guru. The temple authorities had assured us that he was the topmost servant of Prabhupada, an incarnation of Nityananada and confidant to Radharani. Not knowing better, we did accept such arrangement, however this was indeed bad training and faulty practice and definitely should not be allowed to continue. By calling you as not an uttama-adhikari I did challenge your position. If so, how did you allow this misunderstanding to go on? You are perhaps the most advanced devotee of Prabhupada and it is not at all a fault that you are not quite on the platform of uttama-adhikari. It is my opinion that no one yet is on that most exalted platform of being fully conversant with the science of Krishna consciousness simply by witnessing the present confusion and controversy surrounding this guru issue. Because I have risked my spiritual assets and in the name of Vaishnava aparadha, I may go to hell. We would like you to please chastise us by strong arguments how we have erred in our serious research in which we have spent long hours so that we can make some apology and make advancement in Krishna consciousness. 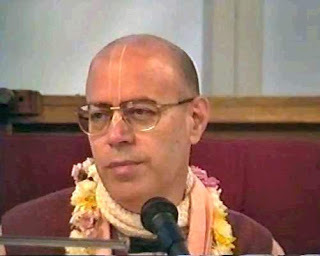 If we are right however, then let us adopt the suggestions and proposals we have outlined in our essay, "Some Practical Suggestion on the Guru Issue" which, in a nutshell suggests that the whole ISKCON society should contain all Prabhupada disciples until that time a highly advanced guru comes out to not only rectify ISKCON, but to see that the interests of Krishna consciousness are impacted on modern society. That's a safe way to see that Prabhupada is put in the center as we have just begun to scratch the surface of the fathomless teachings of his books and lecture tapes. By having everyone study Prabhupada, there is less chance of sectarianism and party spirit to factionalize ISKCON. Please consider this suggestion very carefully as it is quite controversial. I have done this in pursuance of the truth as given by the infallible disciplic succession. Just like the exalted six goswamis who have scrutinized the Vedic literatures to establish the sva-dharma or the occupational duty of people in this age, we have studied Prabhupada's books in order to come to the proper conclusions concerning the guru and topics surrounding him. We are nothing but since we have done this without trying to do any harm or without any pretension, we hope that we have supported the conclusions of the science of Krishna consciousness. If divine truth is effortlessly passed through the ages intact, then there would be no necessity for our writing such book and letters. Just like a weed sprouts up when the devotional creeper gets watered, we see the guru issue as a weed that should be nipped as soon as possible. As Narada warned Vyasadeva in the first canto of the Bhagavatam during Vyasa's despondency, Narada exclaims that any deviation, no matter how slight, is a cause for havoc on the path of devotional service. Declare everyone as Prabhupada disciple. They may remain the eleven acharyas' disciples if they opt for it, but don't encourage it. Let them all drink the nectar of the lotus feet of such a highly advanced guru directly without guilt as this privilege is due them according to the mercy of Krishna. It is their right. This process can go on for many thousands of years if necessary until the successor comes out. If the Gaudiya Matha had initiated on Bhaktisiddhanta's behalf, after his departure, they would have not become the dead or dying branch they are today. A radical departure requires a radical cure. We have presented our case just like a lawyer with various evidences from the lawbooks of Prabhupada. I hope that this attempt to address the guru issue meets with your interest and stimulates some thought. You are an expert judge and have heard our side as well as others now you can render some decision for the good of ISKCON during your meetings with other GBC men. I do realize the extremely controversial suggestions we are proposing but perhaps they only appear incredible due to their simplicity. However, due to extensive and impartial research, all arguments have led us to such conclusions. In other words, the conclusion reached herein has been supported by all angles of shastric vision. Otherwise we would not dare try to lecture anybody like you. Please consider all these points and we hope that you may see fit to reply. Please excuse our strong words and offenses. All glories to you because you have adopted service to Prabhupada as your mission in life. I apologize because sometimes you have to listen to such verbal abuse from belligerents like me. May all the higher authorities bless you in all your endeavors, may Prabhupada be pleased with you always. Hare Krishna. Please accept my humble obeisances. Thank you for your letter dated 26 Feb 1987. In your letter, you had mentioned the possibility of sending me the results of the Mayapura ishta-goshthi concerning our proposals on the status of all gurus within ISKCON. I do realize the great deal of controversy that this issue evokes and cannot comprehend what form of reply you would care to make about this matter. As far as I can understand, not much had been resolved at Mayapura about understanding the requirements or the method of selecting gurus within ISKCON in reference to the revealed scriptures or the directives of Prabhupada. As far as I had understood, you have openly stated in your lectures and conversations that Prabhupada did not select anyone to act as diksha-gurus. So, we have suggested to you as chairman of the GBC that devotees may take advantage of Prabhupada's mercy directly by being initiated as Prabhupada disciples under the guidance of the bona fide devotees within ISKCON. This proposal may be further supported by this quote from a letter by Shrila Prabhupada to Dinesh (10-31-69): "Regarding the disciplic succession coming from Arjuna, disciplic succession does not always mean that one has to be initiated officially. Disciplic succession means to accept the disciplic conclusion." But how can we understand gurus that have done so many controversial things that they must be disciplined, "bloop" or removed altogether from ISKCON? And now there are more and more new gurus. So what is the qualification of these new and newer gurus? We are simply trying to understand the reasoning of the GBC. I hope that you have time to reply. Please also find enclosed a new publication called the Vedic Advocate; a newsletter that I have started earlier this year. I hope that it meets with your approval. Thanks again for being so kind as to give your attention to these matters. Lord Krishna and Prabhupada have blessed me with your association. Thank you very much. Hare Krishna. Please accept my obeisances. All glories to Srila Prabhupada. I beg to acknowledge receipt of your letter dated January 12, 1987. Rather than going into a lengthy discussion, I feel that you have made a very cogent presentation and I would be prepared to agree with you on a single point: Everyone in ISKCON is Prabhupada's disciples. Rather than trying to discuss the nuances of whether they are diksa disciples, ritvik disciples, siksa disciples, etc., let us be satisfied to come to this mutual agreement: Everyone in ISKCON is Prabhupada's disciple. That does not bar them from being the disciples of others as well. But we should understand that the greatest emphasis has to be laid on the indebtedness that each ISKCON member has to Srila Prabhupada. Although there may be advantages to discussing the finer nuances on each individual's relationship, I think such a discussion would be more profitable if there were a number of people present to add their conclusions rather than a discussion between only ourselves. I do not know whether such a discussion will take place in the future, but I hope that it will. In the meantime, I am certainly embracing this mood of encouraging all devotees of ISKCON to feel their connection with Srila Prabhupada is legitimate and equal, whether they have met him physically and taken initiation from him, or not. The entire issue is how much they take shelter of his instructions. That will actually determine their legitimacy as his disciples. Again I thank you very much for your enlightening words and hope this meets you well. We hope that the Vedic Advocate can at least help provide the forum requested by Shrila Gurudeva so that the guru issue can be resolved. As stated by Hanumat Swami in his periodical "Hanuman Express Dispatch": "All that is needed for evil to prosper is for good men to do nothing." Our humble request is that devotees give some thought of how to try and resolve the guru issue to the satisfaction of the disciplic succession.